Government and corporate procurement professionals and individual consumers are end users of a wide range of wood products from furniture and flooring to firewood, mulch to bio-energy. As the beginning of the wood use chain, they can help drive market demand by asking for and buying urban and community wood products. If end users ask for urban and community wood, architects and designers will specify it and stores will stock it, woodworkers will use it, sawyers will mill it, and arborists will harvest it. If you’re interested in supporting the reclamation of urban and community wood, you may want to work with intermediaries who are committed to using it. Click on the intermediaries page to learn more about the role that architects, designers, and stores play in materials selections. You may also want to work directly with woodworkers and wood products manufacturers and sawyers. Click on the woodworkers page to find wood products manufacturers or click on the sawyers page to find custom sawyers and sawmills that can supply you with urban community wood. To help generate demand among end users, the Wood Utilization Team worked with the Illinois Department of Agriculture to commission a podium and gift pens made from Emerald Ash Board. And, to spread the word about the potential for community wood use, the Wood Utilization Team has generated 30 prominent Chicago media placements and two national television network news stories. 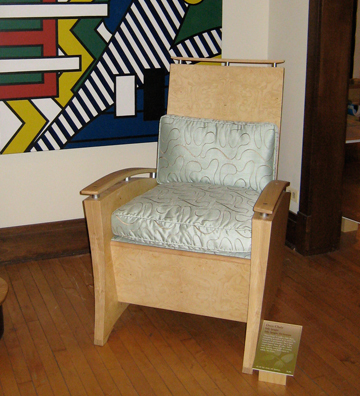 Two stories, in particular, sparked the public’s imagination about the potential of community wood use: the creation of furniture from Emerald Ash Board featured in Rising From Ashes: Furniture From Lost Trees, a traveling juried furniture exhibition, and the manufacture, from diseased ash trees, of Wilmette Wonder Boy baseball bats for Little League players as featured on the Today Show.